The tour features the famous historical and cultural sites as well as the beautiful natural attractions in Central Thailand. It includes the famous floating market of Damnoen Saduak, Kanchanaburi with the Bridge over the River Kwai, the Death Railways, Erawan National Park and the historical sites of Ayuthaya. Explore the natural heritage Khao Yai National Park and the historical sites in the ancient city of Prachinburi. The maximum number per group is 8. No more frustration. This steel bridge is one of the essential historical destination and memorials in Thailand. The bridge is well-known for its history of conflict and bloodshed, as it was part of the railway lines in World War II. 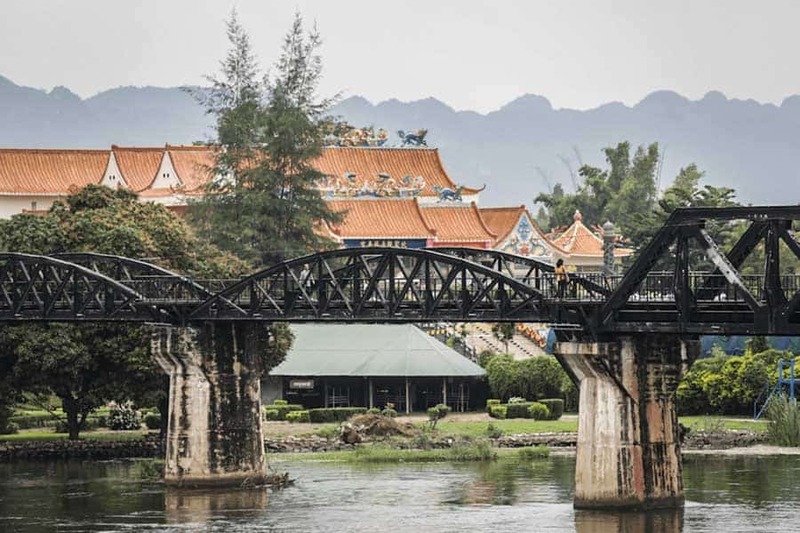 After the War, the damaged bridge was renovated by the Thai government in 1946. It became almost a symbol for Kanchanaburi province. The most famous floating market in Thailand is none other than the Dumneon Saduak Floating Market. The market is lively from early morning with Tourist from all over the world. 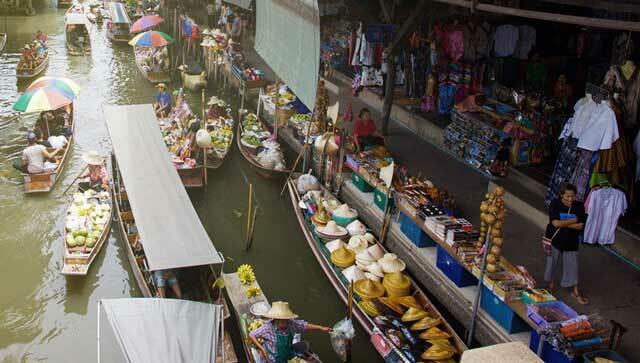 One can choose to explore the floating market by walking on the canalside or take a boat ride through the market. Food, souvenirs and many other merchandises are offered in the market. Take you away from the cities and the crowd. Khaoyai National Park will get into the hearts of nature lovers. Home for wildlife such as birds, elephants and many more. 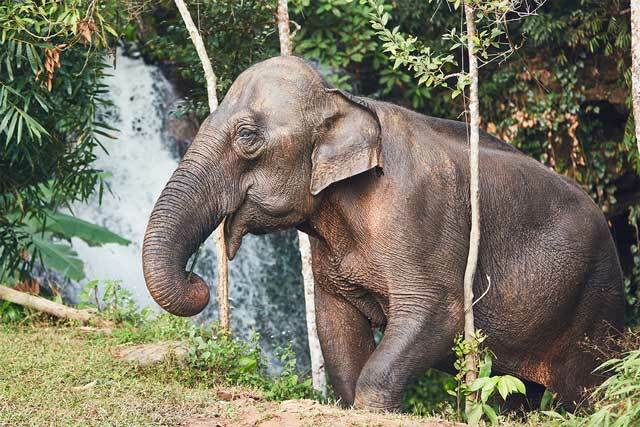 There’s a chance you might get to see wild elephants, Sambar Deer, Indian Muntjac and rare birds. Early morning, pick up from the hotel and drive to Kanchanaburi Province, approximately 129 kilometres West of Bangkok. Visit the Bridge over the River Kwai constructed in 1942. Over 16,000 POWs from England, Australia, Holland and America and 90,000 laborers from Thailand, Myanmar, Malaysia and Indonesia died during the construction. Then proceed to Donrak War Cemetery where the remains of 6,982 POWs were buried as well as the Thailand – Burma Railway Centre. Then board on the famous “Death Railway” and ride along the exciting route overlooking the Kwai Noi River. After lunch at a local restaurant, visit Erawan National Park, 65 kilometers away from Kanchanaburi town. The park, covering 550-square-kilometers, is the site of the seven-tiered Erawan waterfall, one of Thailand’s loveliest waterfalls. The second tier has a pool, which is an ideal for swimming and is particularly picturesque. Explore the waterfalls and the surrounding nature as well as enjoy swimming and relaxing. Overnight at the hotel in Kanchanaburi. Early morning, drive to Ratchaburi Province. Visit the famous Damnoen Saduak Floating Market where farmers and merchants load their goods on small “Sampan” boats to meet and trade. Then further to Nakhon Pathom to visit the temple Wat Phra Pathom Chedi with its upside down bell shape sacred Chedi (Lankan style), which was built by King Rama IV and completed in the reign of King Rama V in 1870 AD to house the3 Lord Buddha’s relics. The height from the ground to the top crown is some 120.45 metres, and the total diameter at the base is 233.50 metres. After lunch at a local restaurant, drive to Samphran Elephants’ Ground and Zoo to see the historical elephant theme shows; crocodile farm and crocodile wresting show. Continue to Ayutthaya, one of Thailand’s historical and majestic highlights. Serving as the capital for 417 years (1350-1767), it was once glorified as one of the biggest cities in the world, a Southeast Asia center for civilizations. During the 17th century, most foreign visitors to Ayutthaya, traders or diplomats alike, claimed Ayutthaya to be the most illustrious and glittering city that they had ever visited. Overnight at the hotel in Ayuthaya. After breakfast, explore some of the numerous magnificent structures and ruins concentrated in and around the city island of Ayuthaya, surrounded by the Chao Phraya, the Pasak, and the Lopburi Rivers. Visit the important historical sites of Wat Si Sanphet and Wat Yai Chai Mongkol located in the historical park which has been included in UNESCO’s World Heritage list. Then continue your trip to Khao Yai National Park, which covers an area of 2,168 square kilometers in the Phanom Dong Rak mountain range, stretches over 4 provinces including Nakhon Ratchasima, Nakhon Nayok, Saraburi, and Prachin Buri. Khao Yai became Thailand’s first national park on 18th September 1962 and is also originally recognized as the National Park Heritage of Asian Group Countries. The park is comprised of mixed forests and rainforests with some wide plains and grasslands interspersed with verdant forests. There are many valuable plants, including commercial plants, scented plants, and herbs. In addition, there are several mountains with peaks ranging from 800 to 3,000 meters above sea level making Khao Yai a cool climate area, even in summer. Guests enjoy a mini trekking tour between 3 and 8 km through the dense tropical rainforest of Khao Yai. Appropriate shoes and binoculars are recommended. Overnight at the hotel in Prachinburi. After breakfast, drive to Si Mahosot ancient town. In the old days, Prachin Buri had a long history of the civilization of about 800 years ago , since the Lopburi period . Visit Wat Ton Si Maha Pho to see the oldest and largest Pho tree of the country. Then continue to the ruined town of Muang Si Mahosot where historical venues that were used for religious purposes and historic materials such as Buddha images, earthenwares, and pottery are discovered. Return to Prachinburi. After lunch at a local restaurant. Then, visit Chao Phraya Abhai bhubate Hospital and Herbal Center famous for Thai herbal medicine and herbal products. The herbs museum building inside the hospital, constructed in 1909 as a residence for King Rama V in Renaissance style, is worth a visit. Return to Bangkok via Nakhon Nayok, passing by beautiful greeneries and numerous nurseries for pot-flowers. Arrive Bangkok and transfer to the hotel.